Morante is one of the major nations of Japethe and the mother country of the colony of Varre to the southeast of Aradie. Morante is bordered on the south by Saronne, to the east by Guiern, to the north by the Kennard Reach, and the Levian Ocean on the west. Its capital city is Coeurvain. Its great spirit is Thaust. Its symbol is the lion. 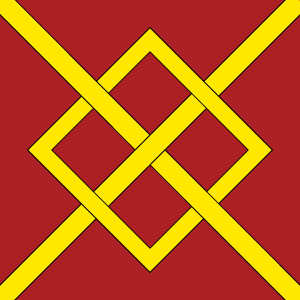 Its flag is either three golden lions puissant on a field of red or a hollow golden diamond with crossed diagonal lines bisecting the sides of the diamond. Morante is hampered in seafaring by a rocky coast with many cliffs and few good harbors. The land itself is lightly forested and relatively flat with only a single broad massif rising in the northwestern part of the country. Morante is excellent cattle country, and is renowned for its cheese and beef. The countless meadows grow most of the flax used in Japethe, while the plentiful apple orchards produce vast quantities of cider and brandy. Morante is ruled by a constitutional monarchy where the powers of the throne are checked by a council of marquises, called the Assembly of Notables. The current ruler is Queen Marguerite of House Vallier. Her family has ruled Morante for seven generations. They have kept the marquis in line by channeling their aggression against their neighbors of Saronne, Guiern, and the Freeports of the Kennard Reach. The policy of keeping internal peace by promoting external war has resulted in sour relations and given the nation a reputation of belligerence. Morante last fought Saronne nearly twenty years ago for control of the Alagnon River. While the war ended in a draw, both sides have rebuilt their strength since then, and most people feel that war is once again on the horizon.